Alpenglow illuminates the rocks as the first light of the day hits the peaks of the Dolomite Alps seen from near Tre Cime (Drei Zinnen). 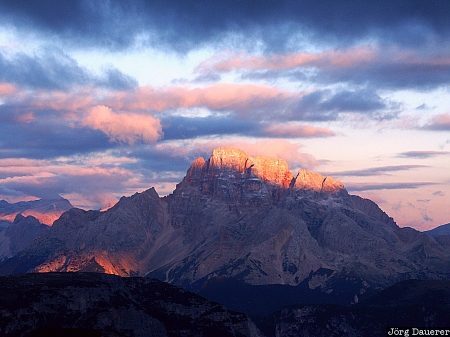 Tre Cime is in the province Belluno in northern Italy. This photo was taken in the morning of a sunny day in September of 2003. This photo was the image of the month in June of 2012. This photo was taken with a digital camera.